The TxWes Reads One Book is a series of events throughout the academic year sponsored by the Eunice and James L. West Library. The TxWes Reads One Book program is designed to foster campus community by offering engaging conversations relating to various themes of a particular book. 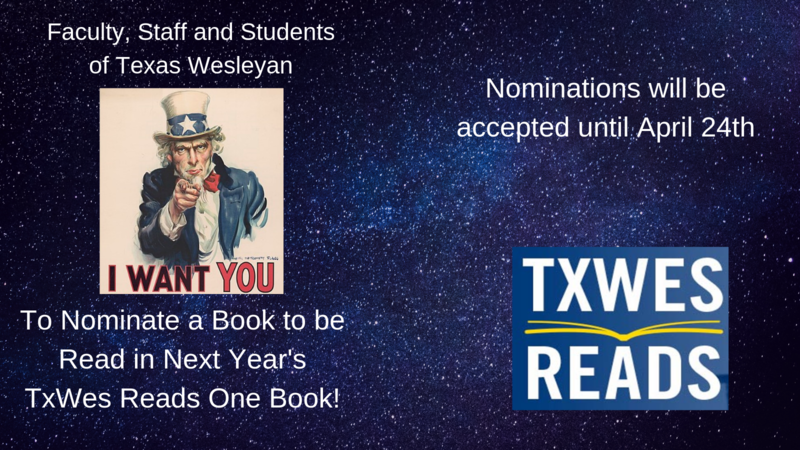 Nominations for 2020 TxWes Reads Book!! The staff at the West Library needs your help. We’re looking for book nominees for the 2019-20 TxWes Reads. Help us pick a book that you (and many others) will want to read. Two years ago, the library began the TxWes Reads program with an ambitious goal: to encourage everyone on campus to read the same book. Picking the book at the end of the spring semester, students, faculty and staff have the opportunity to read the selection over the summer. Then a series of programs occur throughout the year to explore themes and discuss issues that are addressed in the book. The first book was 1984 by George Orwell. The second one was something completely different: The Hate U Give by Angie Thomas. Third one? That’s the next one! Just follow the link below to the form!!. Be ready to fill in the details of the book and why you think it would be a good TxWes Reads book. You can submit nominations until April 24th. We look forward to hearing from you. Thank you!